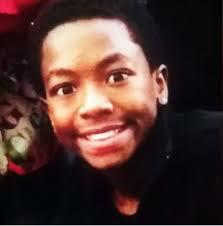 Tyree King, a 13-year-old boy, was mistaken for a robbery suspect — and his BB gun was mistaken for a real firearm — on Wednesday night when a Columbus, Ohio, police officer shot and killed him. Columbus police officers responded to a call about an armed robbery on the night of Wednesday, September 14. According to Columbus police, the victim said a group of people approached him and demanded money. One of the robbers allegedly had a gun, the Associated Press reported. About a block away, police officers ran into a group of three people who matched the description of the robbery suspects. Two people in the group ran off, and officers chased after them. That’s when King, one of the fleeing suspects, allegedly pulled out a BB gun with a laser sight from his waistband, and an officer shot and killed him. King later died at a local children’s hospital. 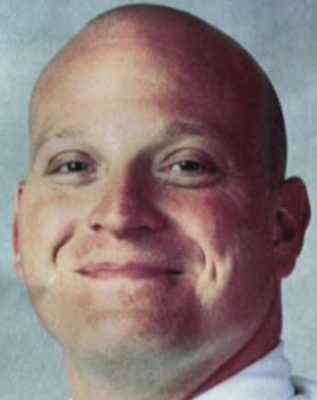 Columbus cop Brian Mason had killed before in 2012. The other person who fled with King was interviewed and released. The robbery is still under investigation, and an internal investigation into the police shooting is underway. So far, we only know what police have said about the shooting. For many critics of police, this is as good as knowing nothing. Trust in the police is fairly low in Black communities across the country to begin with — only 30 percent of Black people reported “a great deal” or “quite a lot” of confidence in the police during a 2014-’15 period, versus 57 percent of white people, according to Gallup. And over the past few years, several police accounts of shootings or killings, such as the police shootings of Samuel DuBose in Cincinnati and Laquan McDonald in Chicago, have also fallen apart when interrogated with video evidence — making it especially hard for activists and protesters to take cops at their word. 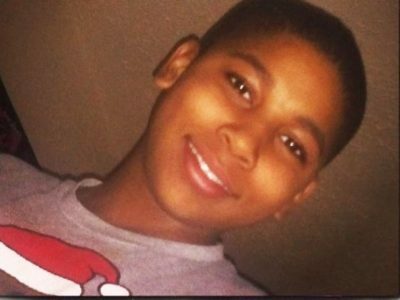 12-year-old Tamir Rice, killed by Cleveland police two years ago. Cops were never charged. Despite the few details, the police shooting is the latest to draw attention on social media from activists in the Black Lives Matter movement. The shooting has drawn comparisons to the police shooting of Tamir Rice, a 12-year-old black child whose toy gun was also mistaken for a real firearm. To critics of police, Rice’s death — and possibly King’s — was yet another example of the racial disparities in police use force and, in their view, how police are less likely to value black lives. 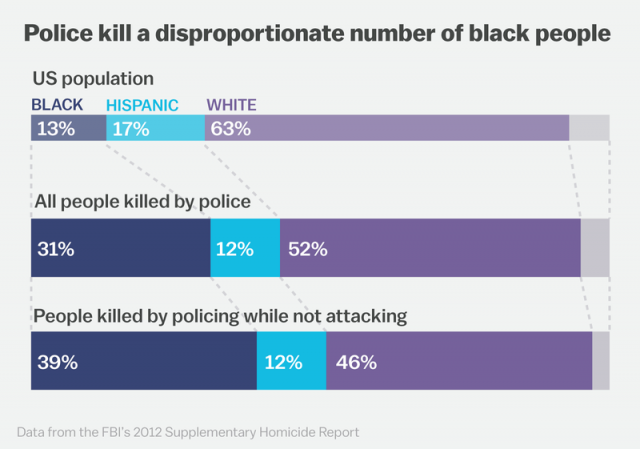 An analysis of the available FBI data by Vox’s Dara Lind shows that US police kill Black people at disproportionate rates: They accounted for 31 percent of police killing victims in 2012, even though they made up just 13 percent of the US population. Although the data is incomplete, since it’s based on voluntary reports from police agencies around the country, it highlights the vast disparities in how police use force. 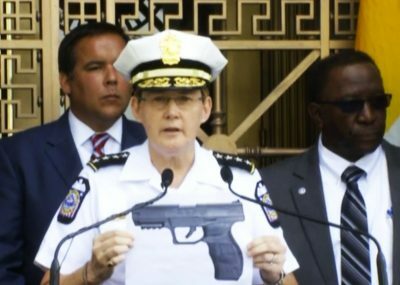 Columbus, Ohio police chief Kim Jacobs holds up photo of gun in question, clearly out of proportion to real size. She defended killer cop Mason’s actions. There have been several high-profile police killings since 2014 involving black suspects. In Baltimore, six police officers were indicted for the death of Freddie Gray while in police custody. In North Charleston, South Carolina, Michael Slager was charged with murder and fired from the police department after shooting Walter Scott, who was fleeing and unarmed at the time. In Ferguson, Darren Wilson killed unarmed 18-year-old Michael Brown. In New York City, NYPD officer Daniel Pantaleo killed Eric Garner by putting the unarmed 43-year-old black man in a chokehold. . . .
Part of the solution to potential bias is better training that helps cops acknowledge and deal with their potential subconscious prejudices. But critics also argue that more accountability could help deter future brutality or excessive use of force, since it would make it clear that there are consequences to the misuse and abuse of police powers. Yet right now, lax legal standards make it difficult to legally punish individual police officers for use of force, even when it might be excessive. Legally, what most matters in police shootings is whether police officers reasonably believed that their lives were in immediate danger, not whether the shooting victim actually posed a threat. So in the King case, the question is whether the officers involved thought he reasonably posed an immediate threat to them or others — something they might be able to demonstrate by arguing they thought the BB gun was a real firearm. In the 1980s, a pair of Supreme Court decisions — Tennessee v. Garner and Graham v. Connor — set up a framework for determining when deadly force by cops is reasonable. Constitutionally, “police officers are allowed to shoot under two circumstances,” David Klinger, a University of Missouri St. Louis professor who studies use of force, told Vox’s Lind. The first circumstance is “to protect their life or the life of another innocent party” — what departments call the “defense-of-life” standard. The second circumstance is to prevent a suspect from escaping, but only if the officer has probable cause to think the suspect poses a dangerous threat to others. The key to both of the legal standards — defense of life and fleeing a violent felony — is that it doesn’t matter whether there is an actual threat when force is used. Instead, what matters is the officer’s “objectively reasonable” belief that there is a threat. That standard comes from the other Supreme Court case that guides use-of-force decisions: Graham v. Connor. This was a civil lawsuit brought by a man who’d survived his encounter with police officers, but who’d been treated roughly, had his face shoved into the hood of a car, and broken his foot — all while he was suffering a diabetic attack. The court didn’t rule on whether the officers’ treatment of him had been justified, but it did say that the officers couldn’t justify their conduct just based on whether their intentions were good. They had to demonstrate that their actions were “objectively reasonable,” given the circumstances and compared to what other police officers might do. What’s “objectively reasonable” changes as the circumstances change. “One can’t just say, ‘Because I could use deadly force 10 seconds ago, that means I can use deadly force again now,” Walter Katz, a California attorney who specializes in oversight of law enforcement agencies, said. In general, officers are given lot of legal latitude to use force without fear of punishment. The intention behind these legal standards is to give police officers leeway to make split-second decisions to protect themselves and bystanders. And although critics argue that these legal standards give law enforcement a license to kill innocent or unarmed people, police officers say they are essential to their safety. Police are very rarely prosecuted for shootings — and not just because the law allows them wide latitude to use force on the job. Sometimes the investigations fall onto the same police department the officer is from, which creates major conflicts of interest. Other times the only available evidence comes from eyewitnesses, who may not be as trustworthy in the public eye as a police officer. If police are charged, they’re very rarely convicted. The National Police Misconduct Reporting Project analyzed 3,238 criminal cases against police officers from April 2009 through December 2010. They found that only 33 percent were convicted, and only 36 percent of officers who were convicted ended up serving prison sentences. Both of those are about half the rate at which members of the public are convicted or incarcerated. The statistics suggest that it would be a truly rare situation if the officer who shot and killed King was convicted of a crime. In this case, the family doesn’t even have the advantage of video footage of the shooting itself, which persuaded prosecutors before to press charges for the police shootings of Samuel DuBose in Cincinnati, Walter Scott in North Charleston, South Carolina, and Laquan McDonald in Chicago. This entry was posted in Uncategorized and tagged AiyanaJones, Beatbackthebullies, blacklivesmatter, CopsoutofBlackandpoorcommunities, JAILRACISTKILLERCOPS, saveourchildren, StandUpNow, TamirRice, TyreeKing. Bookmark the permalink.